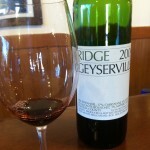 Visiting Ridge was an inspiring trip opening our wine mind to a new region. The Santa Cruz Mountains are just south of San Francisco and part of the Pacific Coast Range. They form a ridge along the San Francisco Peninsula close the Silicon Valley. Our visit topped the list of recent winery visits. The wine is great, views are unbelievable and the experience is ideal for a wine and cheese paring. 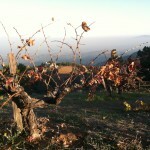 The location of the vineyard offers amazing views perched a top Monte Bello. The challenge with this site is the drive up which includes many windy switchbacks. Along with the challenge of reaching the location our only complaint was the mildly arrogant attitude which was far from inviting. Fortunately our group could enjoy the visit without the welcome. The public can visit two locations, at Monte Bello in the Santa Cruz Mountains and Lytton Springs in Sonoma County, both of which have the distinction of being recognized by the Historic Vineyard Society. Both facilities provide a range of tours and wine tastings. Today, 11 vineyards make up the current Ridge estate, whose signature wines have received numerous international awards. Monte Bello offers tastings on Saturdays and Sundays, from 11am until 4pm, and on weekdays by appointment only. A picnic area is available for small groups. 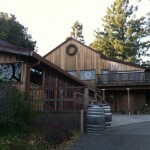 Private and semi-private tours include a walk through the vineyards and the Old Winery Barn. Lytton Springs in Dry Creek Valley, Sonoma County, is open seven days a week from 11am to 4pm, featuring an estate tour and eco-friendly tasting room, a unique building made of straw and utilizing solar power. The use of other ecologically sustainable elements, such as recycled lumber, can be observed throughout the building, as well as in the winery’s sustainable outdoor practices.